I had the pleasure of spending a couple of days recently in Memphis, TN at the 15th Annual MVNC Musculoskeletal New Ventures Conference. Congratulations to MB Ventures and MB Innovations for putting on a first class conference. In addition to some really good barbeque and legendary southern hospitality, I met an outstanding group of companies striving to advance innovative technologies in the musculoskeletal sector. Gary Stevenson (along with Mike Sherman and Matt Hall) were great hosts and oversaw a timely and informative agenda. Along with the early stage companies in attendance there were investors (Morgan Stanley Growth Capital Funds), some larger firms (Medtronic, Zimmer, Centinel Spine and Paradigm Spine), distributors, advisors and other market participants. In between the growth company presentations there were several market update discussions. Observations from these discussions follow. 1) Data, Data, Data – While sound management, a great product and strong IP are “must haves” for any company wanting to launch an innovative product, data is critical to 1) gain acceptance among surgeons, 2) differentiate the product and 3) establish a moat. The dilemma for most new companies is how to fund the clinical studies. The cost of a full-blown PMA is upwards of $100 million and can take 8-10 years. Short of a PMA, good clinical data may suffice. Many companies have chosen to pursue an international development route, in Europe for example, which typically can reduce the time and cost to commercialization. With a CE, companies can establish acceptance and start collecting data on patient performance with their technology. 2) Capital is Scarce – The reality is capital is scarce in the industry. As the medical technology industry has consolidated, a number of the larger companies have de-risked by cutting back on new product development and have become more reliant on smaller companies to innovate. Unfortunately, delays at regulatory agencies and governing bodies have led many venture investors to step away from the medical technology sector. Most funds have a limited time frame (seven to ten years max) for harvesting investments based on their contractual documents. In addition, the allure of quick hit investment opportunities in the IT space has distracted many investors. Fortunately, there are a number of funds in development with a focus on the musculoskeletal sector. In fact, (I hope this doesn’t violate any securities laws) Gary Stevenson is working with a group out of Warsaw, IN and Memphis, TN to launch a new musculoskeletal venture fund – Home Court Ventures. Family Offices typically are more patient investors and potentially an appropriate source for early stage companies with a longer development time frame. At Commenda we work with a large number of family offices, some of which have experience in this space. It is important to note that sector expertise is critical for most offices to invest significantly to an industry. A good example is VB LLC (Viscogliosi Brothers), probably the largest family office focused exclusively on the musculoskeletal sector. The IPO market has been more or less closed to medical technology companies this year until a few weeks ago when three IPOs were launched – Optinose, OrthoPediatrics and Restoration Robotics. J.P. Peltier of Piper Jaffray presented a summary and highlights of the current valuation metrics in the public and private markets. If you are interested in learning more about the benefits and terms of a pre-packaged IPO, I am certain J.P. would be delighted to share his thoughts with you. 3) Distribution – Distribution in the musculoskeletal sector is interesting to say the least. Much of the distribution is handled by a network of independent distributors although some companies with complete product lines maintain a direct sales force. Distribution is a major dilemma for early stage companies. The working capital required to ramp up sales (inventory, tools and receivables) is always far greater than most anticipate. Adding a direct sales force is expensive and only adds to the capital requirement. Independent distributors alleviate the capital requirement but typically at a cost of higher payouts. Because of this, many parties recommended pursuing a geographically focused startup phase where you can establish that a group of surgeons have interest, trial, acceptance and reorder the products. Once you show a captive revenue stream in certain markets, distributors or larger players (depending on your plans) can do the math for national or global distribution. 4) Accountable Care is Here to Stay – There is intense pressure from Insurers (payers) and Hospitals (providers) to develop a healthcare system that produces better outcomes at lower costs. Innovative products that do both are highly desired. Innovative products that only reduce costs or only produce better outcomes are marginal. Obviously, products that do neither need to be rethought. Risk Sharing is a popular concept these days among payers, providers, corporate employers and, apparently now, product manufacturers. Two takeaways were that much of the risk today is borne by the companies covering their employees under self-insurance plans were the insurer is more of a TPA and reinsurer for catastrophic risk (i.e., understand who ultimately is paying) and larger medical device companies are starting to get into Risk Sharing discussions with the payers and providers. This becomes very complicated very fast. 5) Reimbursement – In the medical technology world you must ensure the product is properly coded so that the hospital or surgery center can get reimbursed. Seems easy but can actually be more difficult then regulatory approval as the decision is not made in an open discussion. In fact, as opposed to the FDA regulatory review where there is an open exchange of questions and responses, you are not allowed to converse with the CMS panels. Best advice, start early and hire a good advisor. This is not an endorsement or recommendation of any of these companies. The format of the conference was such that two companies were presenting at the same time so I only had the opportunity to sit in on half of the presentations. 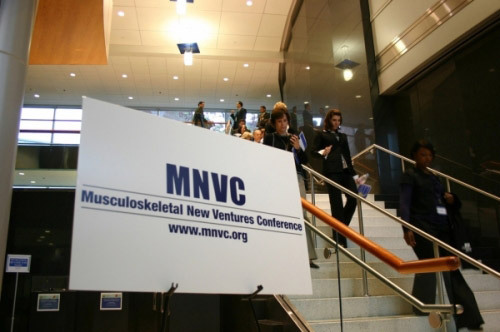 If you are an early stage company with innovative product in the musculoskeletal sector and want to tell your story I would suggest contacting Gary Stevenson at MB Ventures about next year’s 16th Annual Musculoskeletal New Ventures Conference. If you would like to know more about any of these companies, please visit their websites or we would be happy to provide an introduction as appropriate. If you have any questions or comments about the information presented here please feel free to contact me at tsheehan@commendacapital.com or 317.508.3388.